In 1943, Eleanor Roosevelt took the bold initiative to plant a vegetable garden on the White House’s South Lawn. She called it a Victory Garden. 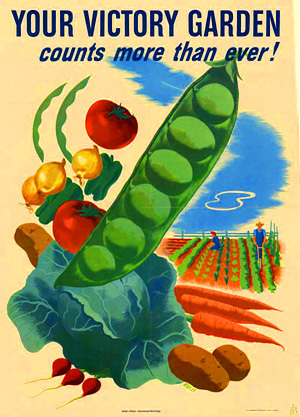 Due to severe food shortages in Europe, Eleanor knew home gardens were imperative to feeding millions of American troops overseas and preventing shortages at home. During World War II over 20 million Americans answered Eleanor’s call to action, producing approximately 40% of our country’s produce. School groups and scout groups cleaned up vacant lots and planted community gardens. Factory workers transformed empty lots adjacent to their work places into vegetable gardens that were tended during work breaks. Americans were involved because they wanted to support the troops while saving some money at home. The City of Denver quickly responded by establishing a Victory Garden Office. On March 28, 1943, just months after Eleanor Roosevelt’s call to action, Mayor Stapleton dedicated Denver’s first Victory Garden. Stapleton said, “The City of Denver believes this is the most important community project that we have ever undertaken.” The community garden was located at East Eighth and Elizabeth, now Congress Park. Denver Urban Gardens continues this tradition by providing technical support to community groups, institutions and individuals throughout Denver. Denver’s slogan was a “Victory Garden on Every Lot.” Denverites did their part by planting 41,500 gardens that first season and by 1944 over 50,000 Victory Gardens were spread across the City. Denver’s Victory Gardens were valued that first growing season at $578,125. To help Denverites start up a backyard plot, the City of Denver devised a “Model Victory Garden.” A list of vegetables that did best in our climate was provided as well as soil preparation and planting instructions. Colorado State College (now CSU) provided the “technical advice necessary to insure success.” CSU Extension Offices continue to provide valuable information on gardening in our unique climate. 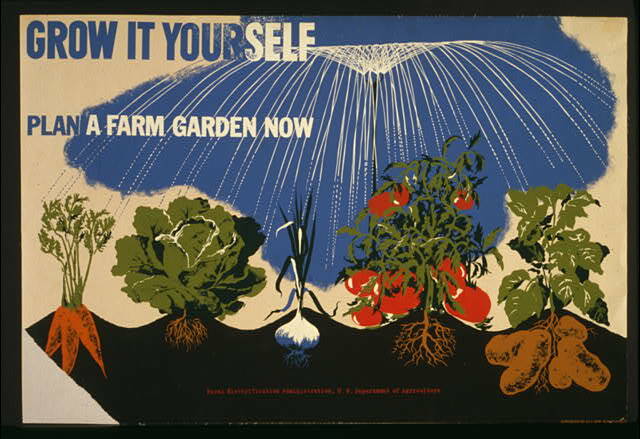 A new Victory Garden movement is sweeping the country and our state. Michael Pollan, a journalist for the New York Times and Professor at UC Berkeley, is leading the charge. His article, Dear Mr. Next President… Food, Food, Food, discusses how vegetable gardens are eloquent solutions to: public health, the local economy, global warming, and education. In response to this article and at many groups’ bequests, Michelle Obama planted a vegetable garden on the White House’s South Lawn in March. Colorado communities are a part of this energetic movement. Leading the effort is Grow Local Colorado. Grow Local is a new project being developed by community leaders, gardeners, locavores, farmers and businesses to help more people grow more food locally. Partners in this effort include representatives from Denver Botanic Gardens, Denver Public Library, Denver Urban Gardens and representatives from the City and County of Denver. Their website is a resource hub for information, expertise and partnership in establishing your own food garden in your home, business, or public space. Grow Local’s goal is to establish 2009 gardens in the Metro Denver area by May 30, 2009. Their site also connects people wanting to grow food with unused space, resources and expertise. Be a part of this exciting movement. Start a new vegetable garden or help a neighbor with theirs. In a few months you’ll reap the benefits of your labor. B50 Note: Barbara Masoner is happy that earth day is here and the snow is gone so she can get busy in her own garden. For more local gardening information, she encourages you to visit Grow Local Colorado. If you are interested in the history of urban gardening in the United States, visit Sprouts in the Sidewalk.